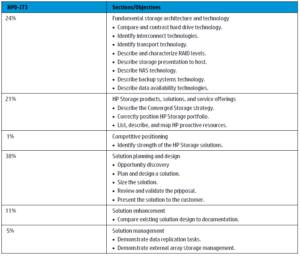 HP0-J73 HP ATP – Storage Solutions V1 Passed! Good times I managed to pass my first HP Storage exam HP0-J73 HP ATP – Storage Solutions V1 yesterday. This exam is part of the HP Storage certification track which I covered here. As with any exam I can’t mention any specifics but I’ll list what I used to study as it will hopefully be useful for others taking this Exam. 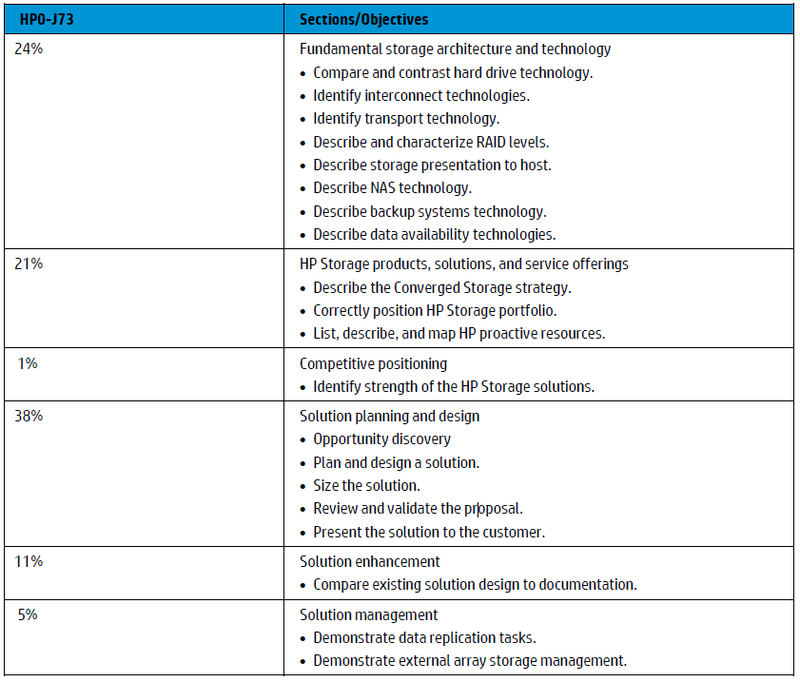 Know the HP storage tools SBW, HP Storage Sizer etc all quite easy stuff and covered on the course. If you have time, install some of them and have a play. Again you won’t need real detailed knowledge just which tool to use when and how they interact with each other. The best way to gain product knowledge I found was from the QuickSpecs for each product. You can find all the QuickSpecs here . 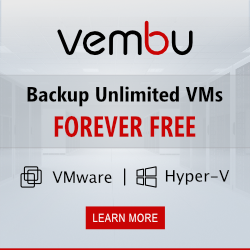 The main products you will need to know about are StoreServ (3Par), StoreEasy, StoreOnce, StoreVirtual, Data Protector and MSL tape Libraries. Know which product to choose for what scenario and also know within a product range which model you would choose i.e. how they scale, which is the performance model etc. Do you have any other information passing this exam. I have good experience with storage but all of the units covered in this exam I have not worked on yet. I have passed my NetAPP storage exam with more ease than this exam (which I failed with 60%) on first attempt. Going through the product bulletin and such will take me months – does HP not have a study materials relevant for the exam without taking on of their costly ILT courses? Welcome to the blog, agreed this is a challenging exam given the amount of different products you need to know about. Remember you do not need to know detailed administration level information for each product, its more about the higher level design and selection decisions. All the other tips I have are in the post, take a look through again and good luck. I am now preparing for the HP0-j73 exam. Despite the fact that I am quite experienced storage engineer, this exam gives me very hard. Could you share a student guide? It would be very helpful to me. This is not an easy exam, but I’m sure you can do it! Just follow all the tips in the post and good luck. The costly ILT course will not help you pass the exam. I took that course, and it was nothing like the exam.